Erin must choose between the money of which she has long dreamed and the man who she has loved. Eight years ago, she chose "loot" when Chris, her former husband, competed for her hand against the god of money. Now, with a promotion within reach, she is poised to take her place among the elite of Wall Street. She will soon be working twenty-four-seven to reorganize a failing company, and she must have someone to care for her children. She has few options, and she reluctantly concludes she must beg Chris for his help. She has not talked with Chris since leaving him, but if she cannot convince him to help her, she will lose her promotion, and her dream of wealth will vanish. Opposites had attracted when they had fallen in love. Erin remembers a Chris who was laid back, satisfied, and unambitious, and he seems not to have changed. He lives on a small island with no home mail delivery. He has no obvious means of support. Erin fears if she asks Chris to care for their children for the summer, she will be drawn back into his world. She will lose her drive to succeed and everything for which she has been working. If he does not help her, her promotion will be denied – and lightning will not strike a second time. How can she send their children to live with him without becoming entangled herself? 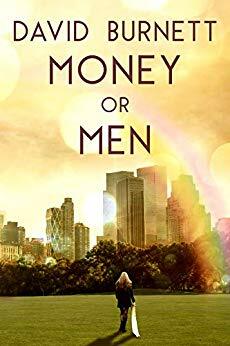 Get "Money or Men" by David Burnett on Amazon for only $2.99!